As a tiny village community in northern Chile becomes the first district in the country to be self-sufficient in energy, a solar power revolution is taking hold across the nation. Until recently, Esquiña was just another small isolated village in the heart of the Atacama Desert, in the northern-most Arica region of Chile. At the end of August, however, it made national headlines as a new photovoltaic (PV) solar panel plant went online, providing the community of 24 houses with 100% of its energy needs and converting it into the first district in Chile to be completely self-sufficient in energy provision. This landmark occasion doesn’t just set a precedent for ways in which isolated communities disconnected from the main national grid can receive reliable energy. It also underlines an arguably far more important turning point in the country’s development: finally, after years of speculation over its potential, solar power is taking off in Chile. The project, which came at a cost of around 200m Chilean Pesos (around US$330,000) and was funded by the Regional Development Sub-Secretariat and the Municipality of Camarones, means that the village will no longer have to rely on an old diesel generator to get electricity often limited to a couple of hours a day, as is generally the case with similar isolate villages in the Atacama and Andean Altiplano (highlands). Instead, the residents of Esquiña will benefit from a constant – and in their case free – supply of clean energy, backed up by dozens of rechargeable batteries that will cater for any spikes in energy demand and night-time usage, allowing many of them to own and use everyday items such as a refrigerator and computer for the first time. “This is a new experience and we hope to replicate it in other isolated localities, and perhaps also to serve as a model for other parts of the country”, said the Mayor of Camarones, Iván Romero Menacho. And while the energy needs of Chile as a whole are almost infinite in comparison to tiny Esquiña, the village is certainly a microcosm of the solar revolution taking place across the rest of the country, in tune with a drive to expand the South American nation’s energy mix to boost energy security and help it lower its carbon footprint as part of its efforts to contribute to the battle against climate change. 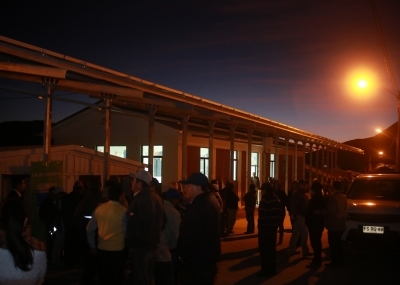 The lights come on in Esquiña, northern Chile, as the village becomes the first community in Chile to get 100% of its energy needs from solar power, becoming self-sufficient in energy provision in the process. Photo courtesy of El Morro Cotudo (local paper). Solar power has long been touted as a source of clean renewable energy with massive potential in Chile, particularly in its northern Atacama and Altiplano regions. The Atacama is the driest desert in the world, with some parts having never recorded any rainfall. The dry, clear skies and atmosphere – helped by an elevation of more than 2,000 metres that leaves moist ocean air cut off – mean that the north of Chile has some of the most favourable conditions in the world for solar power. The fact that much of Chile’s rising energy demand comes from the economically vital copper mines, also found in the north of the country, means that solar farms would be ideally placed to provide these industrial pockets with reliable and clean energy. This is something that many people see as a far more sensible course of action than planning major hydroelectric dams in the far south of the country, such as the now-cancelled HidroAysén project, where the electricity generated would have to be transmitted thousands of kilometres north via giant and high expensive power lines. The Chilean solar revolution has been a long time coming, then, but even as other countries such as Germany and China began to take significant strides in adding solar power to their energy systems, the expected boom in Chile was taking its time as investors held off. Now, though, the barriers appear to have been broken, with the latest figures showing that solar PV generation in Chile had gone from just 0.1GWh (GigaWatts per hour) in August 2013, to 32GWh for the same month this year. This still represents a small fraction of the 430GWh produced by all non-conventional renewable energy (ERNC as they are known in Chile) sources, but it still means that solar is far and away the fastest-growing energy sector in the country. Copper mines in the north of Chile are an essential part of the economy, but they also require huge amounts of energy and are a key factor behind the increasing demand for energy in Chile. Photo courtesy of Sonami (National Mining Society) via Wikimedia Commons. As of the end of August, there was about 244MW of installed solar PV capacity in Chile, with a further 400MW under construction, and a portfolio of nearly 7GW with an approved Environmental Qualification Resolution (RCA by its initials in Spanish, effectively an environmental permit). This includes a massive 698MW project, Campos del Sol Sur in the Copiapó region in the south of the Atacama, which is expected to begin construction this year. In addition to this, there is 110MW of Concentrating Solar Power (CSP) – or solar thermal energy – under construction in the form of the Cerro Dominador plant, and a further 760MW-worth of projects with an approved RCA. These figures, according to the CEO of the CER (Chile’s Renewable Energy Centre) María Paz de la Cruz, “confirm what we said at the start of 2014 when we predicted that this would be the year in which solar power takes off”. This sentiment is reflected by the appropriately-named Alfredo Solar, head of the Chilean division of SunEdison, one of the world’s foremost solar power companies. In an article for the Chilean online news site El Dínamo (link in Spanish), Solar – who is also the current president of the Chilean Renewable Energy Association (ACERA) – claimed that “solar power has arrived and is here to stay” in Chile. Solar highlighted the increasing role of solar power in the Chilean energy mix, and claimed that it had proven itself not to be the highly costly option that its detractors had always claimed, as indeed many still do. However, he also warned of the need for transmission grids to be more efficient to cope with the extra demand for energy in Chile, and to accommodate the new solar and other ERNC projects that are due to come online, saying that otherwise there was a risk that the incipient solar and ERNC industries could be held back. This is an issue that is being addressed, however, with the previous government having approved a new law to facilitate the expansion of the national grid system last year. Chile’s President Michelle Bachelet opens the Amanecer Solar Cap power plant in Copiapó, northern Chile, the largest solar PV farm in Latin America. Photo courtesy of El Dínamo. The solar revolution in Chile is set to march on, then, in line with a general rise in new ERNC projects that have come online in recent times. According to the latest figures, these clean and renewable sources of energy – consisting mainly of solar, wind, biomass, and mini-hydraulic (run-of-the-river hydroelectric – made up nearly 9% of Chile’s total installed capacity, with 1.7GW in operation. More than 600MW has been added so far this year, while a further 797MW is under construction and nearly 12GW-worth of projected have an approved RCA. Onshore wind currently contributes the most, with 40% of the ERNC mix, followed by biomass with 27%, but more than half of the new projects currently under construction or in possession of an RCA are solar powered. Chile is already on track to meet its own “20/25 Law”, passed last year, which commits the country to generating 20% of its energy from ERNC sources by the year 2025, with 45% of new energy capacity coming online between 2014 and 2025 generated from these sources. Chile was also recently cited as one of the most promising countries to invest in for renewable energy, coming 13th in a global ranking by the UK-based consultancy firm Ernst & Young. The study placed Chile as the 2nd best country to invest in for CSP, 9th for PV, and 10th for geothermal power, another as-yet untapped source that experts say could contribute handsomely to Chile’s energy needs. After years of near-darkness, the lights of Esquiña have finally come on. If all goes to plan, the same will soon be true with Chile’s burgeoning solar power sector. El Arrayán wind farm in Chile. 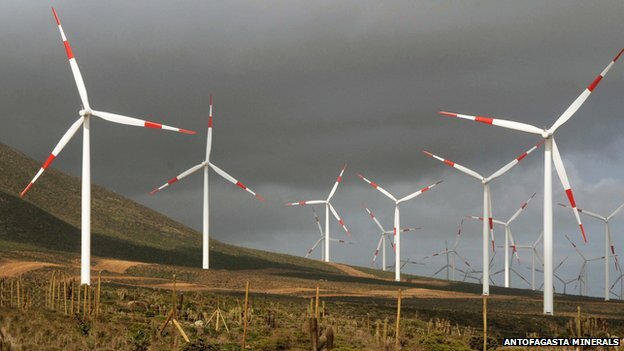 Onshore wind currently accounts for 40% of Chile’s non-conventional renewable energy production, which itself makes up nearly 9% of the total amount of energy produced. However, solar power is expected to overtake wind at some point in the next few years. 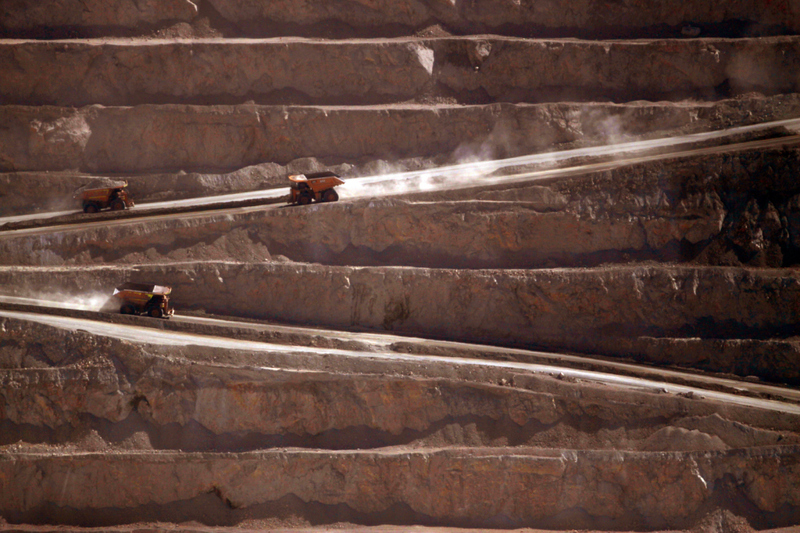 Photo courtesy of Antofagasta Minerals via the BBC.